Navigant Research, and industry analyst firm has issued a report entitled: ‘Navigant Research Leaderboard: Smart Street Lighting,’ in which Signify is ranked as the leader for Smart Street Lighting globally. Navigant Research defines smart street lighting: “A general label for the use of advanced technologies for the efficient operation, monitoring, and management of street lighting within a smart city strategy.” Smart street lighting is enabled by a variety of technologies, including sensors, control nodes, gateways, cameras, wireless communications, and data analytics. 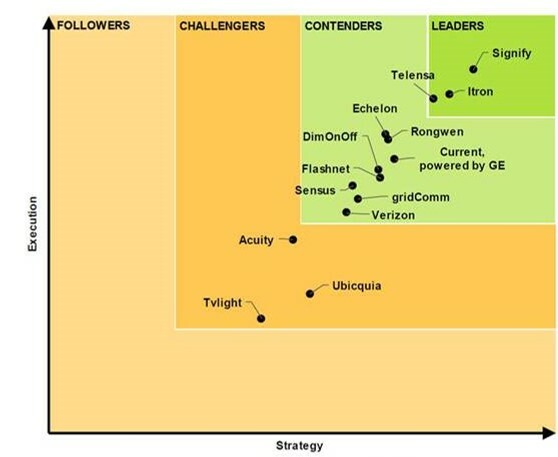 Navigant’s Smart Street Lighting Leaderboard report assesses 14 suppliers of connected street lighting globally on criteria such as, go-to-market strategy, partners, product strategy, geographic reach, market presence, sales, marketing and distribution, product features and portfolio, product integration and staying power. Signify is ranked as the overall leader with leadership in Strategy and Execution. Navigant Research estimates the global market for smart street lighting to be worth $837.4m in 2018. Annual smart street lighting revenue is expected to grow to nearly $8.3bn globally by 2027, representing a compound annual growth rate (CAGR) of 28.9%. It also noted the success of the company’s Interact City LED connected street lighting system and management software which has been deployed in more than 1,000 projects in 37 countries. The report further illustrates Signify’s leadership in smart lighting technologies and underlines its position as the lighting company for the Internet of Things. An executive summary of the report is available for free download here. Signify became the new company name of Philips Lighting as of 16th May 2018.